FILE - Chinese investments in Ivory Coast's Lauzoua manganese mine re-opened the operation to quadruple production of the ore used to manufacture steel. The United States needs to encourage domestic production of a handful of minerals critical for the technology and defense industries, and stem reliance on China, U.S. Interior Secretary Ryan Zinke said Tuesday. Zinke made the remarks at the Interior Department as he unveiled a report by the U.S. Geological Survey (USGS), which detailed the extent to which the United States is dependent upon foreign competitors for its supply of certain minerals. The report identified 23 out of 88 minerals that are priorities for U.S. national defense and the economy because they are components in products ranging from batteries to military equipment. FILE - Interior Secretary Ryan Zinke speaks at the Heritage Foundation in Washington, Sept. 29, 2017. The report found that the United States was 100 percent net import reliant on 20 mineral commodities in 2016, including manganese, niobium, tantalum and others. In 1954, the U.S. was 100 percent import reliant for the supply of just eight nonfuel mineral commodities. 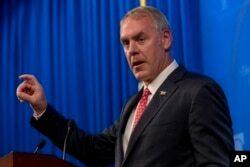 "We have the minerals here and likely we have enough to provide our needs and be a world trader in them, but we have to go forward and identify where they are at," Zinke told reporters at an Interior Department briefing. He also blamed previous administrations for allowing foreign competitors like China to dominate mineral production for minerals, such as rare earth elements, used in smartphones, computers and military equipment. Zinke said the report is likely to shape Interior Department policy-making in 2018, as the agency looks to carry out its "Energy Dominance" strategy, expanding mining and resource extraction on federal lands. The survey is the first update of a 1973 USGS report that catalogued the production of minerals worldwide. The update was started under the Obama administration in 2013. Many of the commodities that are covered in the new volume were of minor importance when the original survey was done, since it pre-dated the global electronics boom. The USGS and Interior Department said the report is meant to be used by national security experts, economists, private companies, the World Bank and resource managers. It does not offer policy recommendations, but Zinke will rely on the findings as he prioritizes research into certain mineral deposit areas on federal land and plans policies to promote mining. "We do expect that to lead to policy changes. The USGS is not involved in policy, but I suspect you will see some policy changes," said Larry Meinert, lead author of the report.